Eli will do anything to protect his family whether they are his flesh and blood or Comanche. 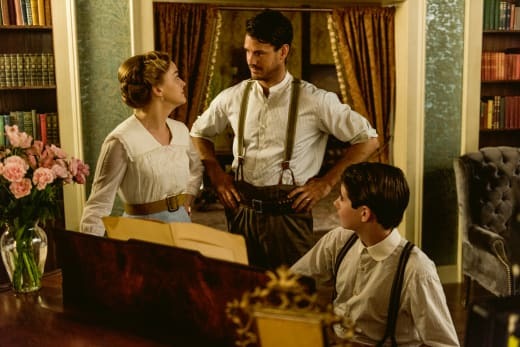 On The Son Season 1 Episode 5 young Eli had to make a decision regarding the Comanche and in 1915 had to do everything in his power to save his family. In 1849 Eli had the opportunity to kill the Indians who killed his family, but once again he decided that wasn't the route he was going to take. He's been held captive for six months now and he feels he's more Comanche that white. He doesn't seem to harbor any ill will towards the Indians that killed his family. He looks to Toshaway as a father figure and his heart belongs to Prairie Flower. While he's accepted by the Indians somewhat, he's still on the outside looking in. He wasn't asked to join the men who talking about the buffalo crisis, but he snuck over to the teepee and looked in as they talked. Charges the Enemy wanted to fight the Tonks for food and horses. Toshaway didn't want to but acquiesced when the rest of the men agreed with the younger Indian. Young Eli was invited along to mind the horses while the Indians attacked the camp, but something was wrong when they arrived. It was too quite. The scouts felt there was a sickness and they were right. Toshaway sent young Eli in to get the Tonks' horses. When young Eli went into the camp he found many dead Indians. They all had died of smallpox except for one leader who told young Eli he should bring the sickness to the Comanche to avenge his family's death. Young Eli could have easily done that without the Comanche even knowing anything. Young Eli was vaccinated against smallpox so he wouldn't be getting sick, but while the thought might have crossed his mind, he decided to protect his new family. It's amazing that young Eli has fit in so well with the Comanche. Does he even think about his mother and siblings? Perhaps they are nothing more than memories now. Perhaps he's just hardened and is in the mindset to do whatever he needs to survive. When he called the white men "them," Prairie Flower seemed to think that meant young Eli was committed to being a Comanche, but he's confused and doesn't know what he is. He's just going along for the ride at this point. In 1915, Eli once again is protecting his family. We knew the seditionists weren't going to let the ambush go. They lost many men in the ambush and the anger is at a heightened level. They are especially angry about the pictures Niles Gilbert took and they blame the McCulloughs for it all. The pictures are everywhere. Even Sally gets hold of one and confronts Pete about it. Their relationship is incredibly strained. I don't know why Sally stays with him. They are on opposite sides of the field. He's afraid to stand up to his father, and when he finally does, he doesn't come across very well. There's no way Eli is going to sell the ranch. Pete can whine all he wants, it's just not going to happen. What Sally wants is for Pete to take her and the kids and just leave, but Pete won't do it. He doesn't have the guts. Eli would probably love for his son to stand up for himself and leave the ranch. Not that he would like them being gone (especially Jeannie), but he'd like that Pete showed some courage. He doesn't like Pete being such a coward. But during the fight at the ranch, Pete impressed Charles with some awesome moves to take down a seditionist who is hiding behind a car. The fight at the ranch was intense. I found myself holding my breath wondering if the Garcias were going to come through and help Eli and his family. It beyond crazy to watch the maid bring Jeannie a glass of water like nothing was happening while back at the ranch Sally was trying to save Jonas' life. Good for Maria for standing up to her father and making him take action against the seditionists. We can only hope that if the Garcias are attacked, the McCulloughs will return the favor. But there's a problem, as Eli has discovered there is oil on someone's land. If it's on Eli's land, that's great and everyone can rest easy. I get the feeling that the oil is going to be on the Garcias land or at least part of their land and it's going to cause issues. Eli wants the oil because he needs to save his ranch. And he'll do anything to get what he wants. The Garcias may be in his good graces right now, but it wouldn't surprise me if Eli turns against them because of the oil. What did you think of "No Prisoners"? Were you surprised the Garcias helped the McCulloughs? If you missed this exciting episode, you can catch up and watch The Son online right here via TV Fanatic.